During May of 2018 we are witnessing yet another serious escalation of the Israeli-Palestinian conflict. Once again, as highlighted in a United Nations news report, the international focus is placed on rockets and mortars shells fired from Gaza towards Israel and the military strikes against Hamas and Islamic Jihad targets in Gaza. Violence takes the center stage, nonviolent actions (such as those by the Palestinian nonviolent protest movement The Great March of Return) and the voices of civilians on both sides (such as the Other Voice, a nonviolent civil movement of Israelis near the Gaza Strip and Palestinians from the Gaza Strip working together to end the conflict) are drowned out. Recognizing the restrictions of the current context (e.g. acceptance of nonviolent peacekeepers to host state and access to particular regions) of allowing professional unarmed civilian peacekeepers to enter the conflict scenario, we want to share some insights from peace science that should at least add Unarmed Civilian Peacekeeping to the toolbox of international intervention to reduce violence and suffering, even if it is only an aspiration in this moment of time. Unarmed Civilian Peacekeeping is a nonpartisan nonviolent intervention for immediate on-the-ground protection of civilians. Unarmed Civilian Peacekeeping efforts employ techniques such as accompaniment, protective presence, local-level shuttle diplomacy, facilitated dialog, confidence building and empowerment. Unarmed Civilian Peacekeeping is expected to be most effective in deterring against violence that violates established global norms (e.g. violence against civilians). “Gaza is ‘on the brink’ warns UN envoy, urging more international intervention” By United Nations News Centre. May 30, 2018. Venturi, B. (2015). Mainstreaming Unarmed Civilian Peacekeeping. Peace Review, 27(1), 61–66. Wallace, M. (2017). Security Without Weapons. 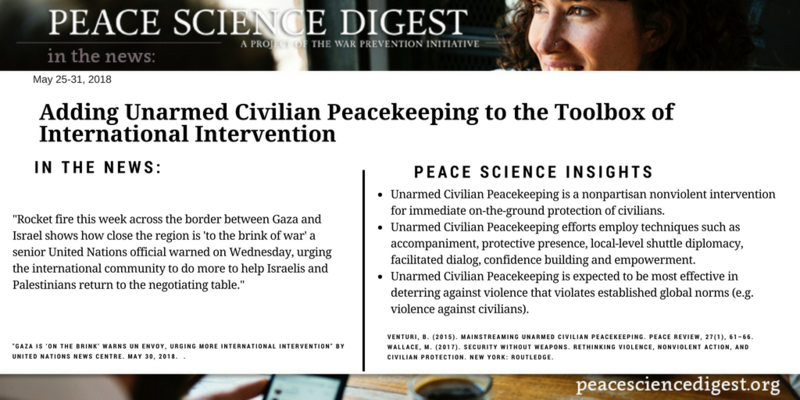 Rethinking violence, nonviolent action, and civilian protection. New York: Routledge.